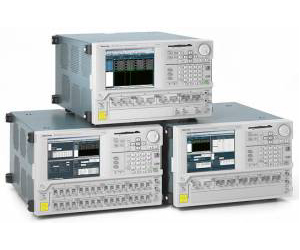 The DTG5000 Series combines the power of a data generator with the capabilities of a pulse generator in a versatile, bench-top form factor, shortening the duration of complex test procedures and simplifying the generation of low-jitter, high-accuracy clock signals, parallel or serial data across multiple channels. Its modular platform allows you to easily configure the performance of the instrument to your existing and emerging needs to minimize equipment costs. Three mainframes and five plug-in output modules combine to cover a range of applications from legacy devices to the latest technologies. In addition, eight low-current, independently-controlled DC outputs can substitute for external power supplies. Each mainframe incorporates a full compliment of auxiliary input and output channels to easily integrate with other instruments, such as oscilloscopes and logic analyzers, to create a flexible and powerful lab.